Flush Designs: Flush Designs and Erin Hearts Court is Featured on Southern Weddings Magazine today! 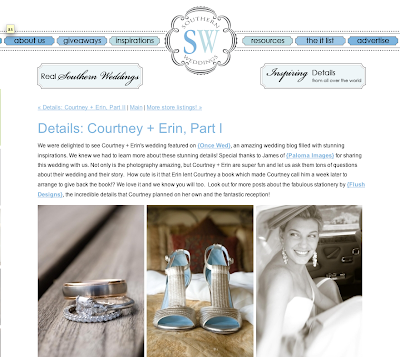 Flush Designs and Erin Hearts Court is Featured on Southern Weddings Magazine today! Hey all just want to tell you to go visit Southern Weddings Magazine today to see the feature of Erin and Courtney's (no, not us, the bride and groom just have the same name) wedding. We shot it in October and has been featured on Once Wed and now Southern Weddings Magazine. So Fun!!! WE are so excited. They did a 4 part feature using a ridiculous amount of pictures! They also dedicated one whole part to just her invites and other wedding stationary done by yours truly! Though Courtney booked us through Paloma Images this wedding was truely the one that really sealed the deal that Erin and I love to shoot weddings together and going forward with our new photography duo Erin Hearts Court!